Blooper Table Lamp, Ash Grey/ Fig Purple fra danske Please Wait To Be Seated med varenummer 1002002. Om varen siger Please Wait To Be Seated ; The BLOOPER TABLE LAMP is a part of PLEASE WAIT to be SEATED’s design collection. This table lamp has a classic and simple expression. The geometrical shape of the BLOOPER TABLE LAMP creates a soft light because the light from the hidden LED bulb is reflected into a hollow disc. By a simple manual movement the small disc can be rotated and works as a switch and a dimmer. This simple manual gesture can turn the light off or gradually let the light ascend to its full reflection. Interaction plays a key role in all PLEASE WAIT to be SEATEDs designs. The disc is attached with magnets, and makes it easy to create colour combinations. 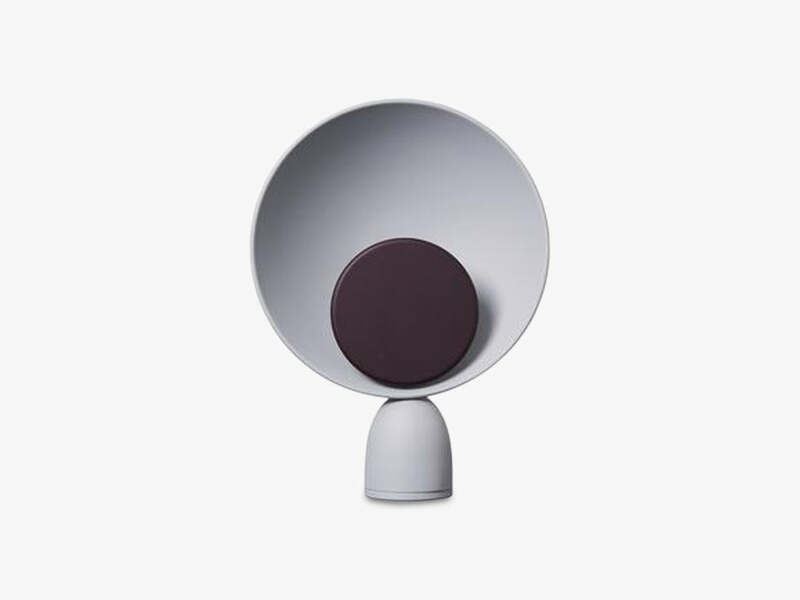 The lamp comes in ash grey with either an ash grey, navy blue or fig purple dimmer disc. Additional dimmer discs can be purchased in the three colours. DETAILS All steel parts of The BLOOPER TABLE LAMP are made by traditional techniques from bygone times, mixed with the newest innovation of LED.